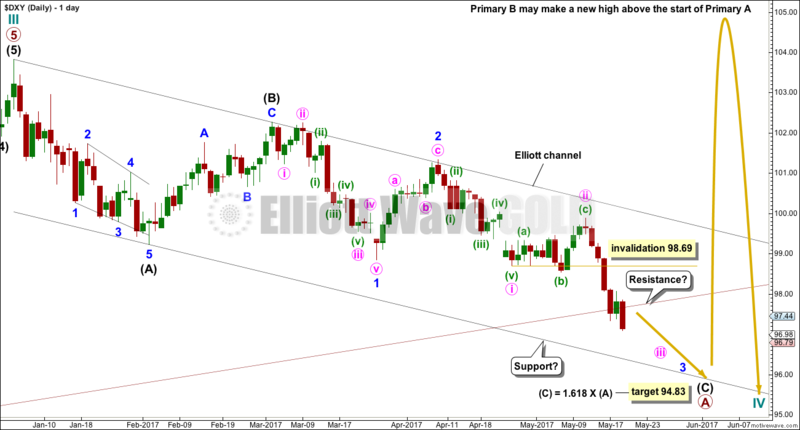 The USD Index continued to move lower as the last Elliott wave analysis expected. The target for a low at primary degree was 94.83. The low was reached 3.01 below the target. 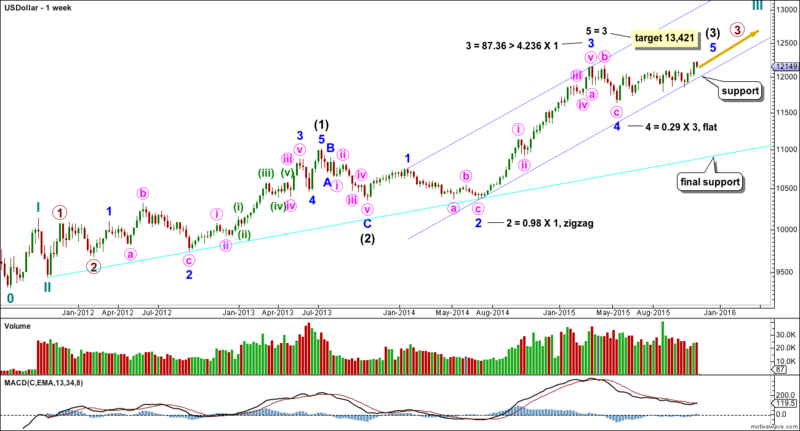 Cycle wave II was a deep 0.89 single or double zigzag lasting 26 months. 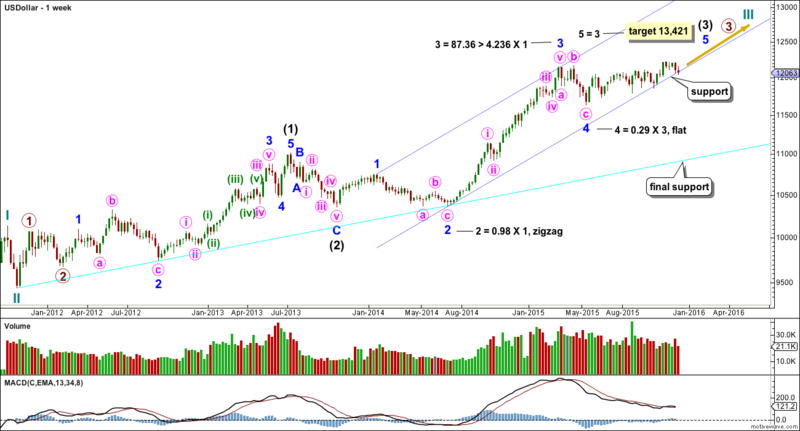 Given the guideline of alternation, cycle wave IV may be expected to be a more shallow sideways correction which would likely be longer lasting. So far it has lasted just ten months. 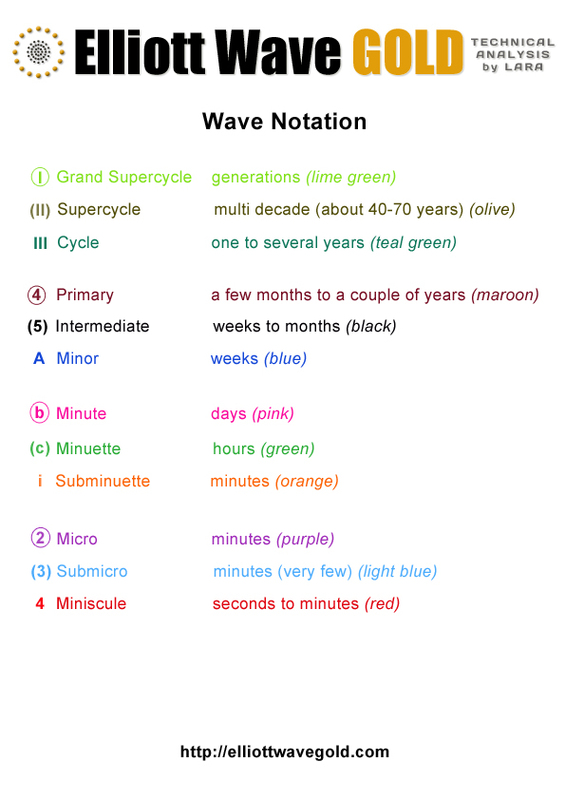 A breach of the maroon Elliott channel provided an indication that cycle wave III was over and cycle wave IV had arrived. 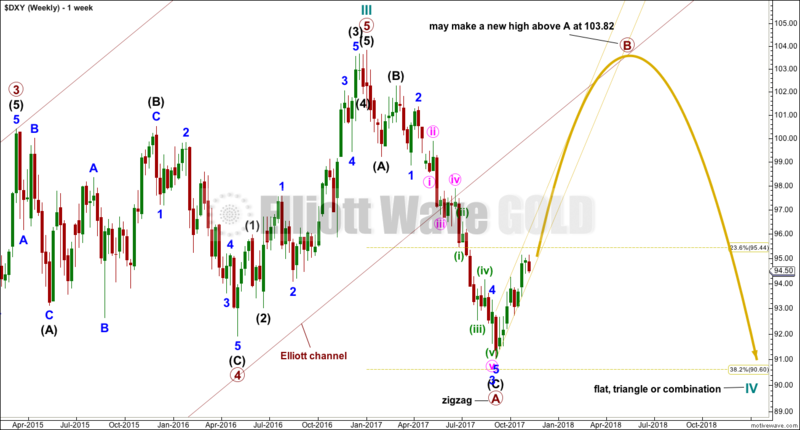 If cycle wave IV is an expanded flat or a running triangle or a combination, then primary wave B or X within it may make a new high above the start of primary wave A or W at 103.82. 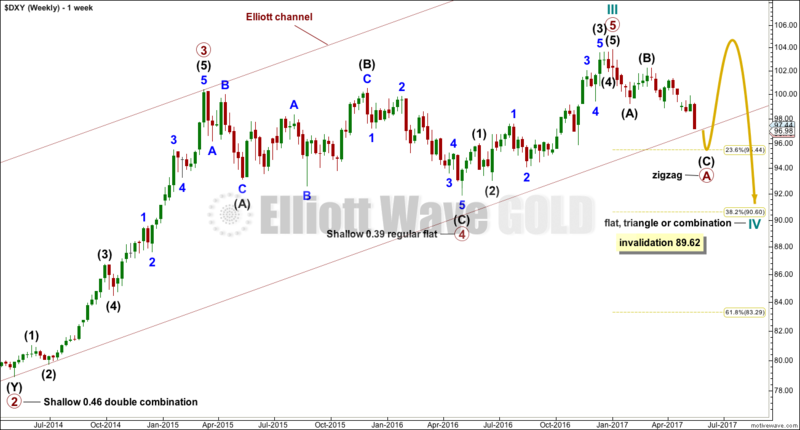 Primary wave B or X would most likely be a zigzag, but it may be any corrective structure. 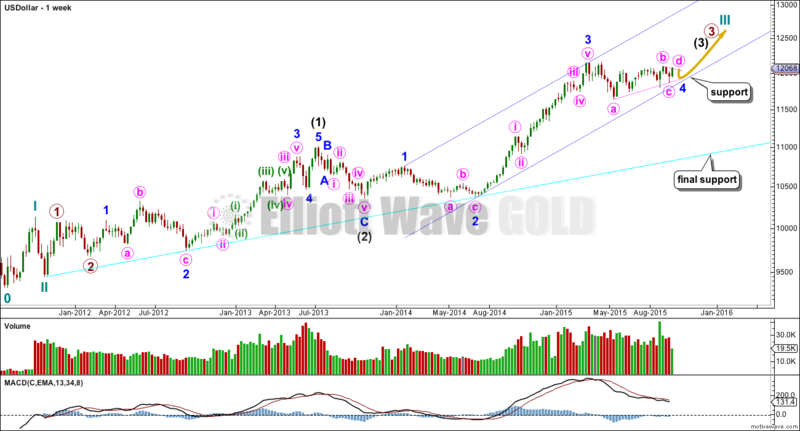 It may be a sharp upwards movement or a choppy overlapping time consuming consolidation. 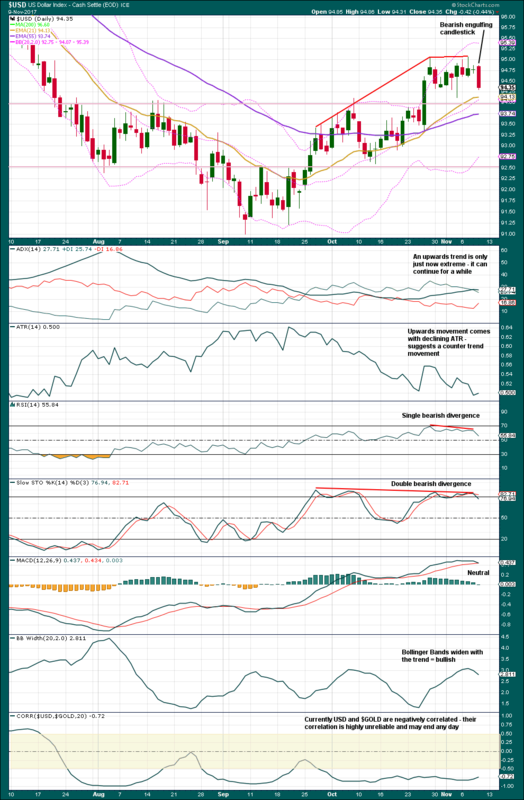 For the short term, while price remains within the narrow yellow channel, assume the trend remains up. 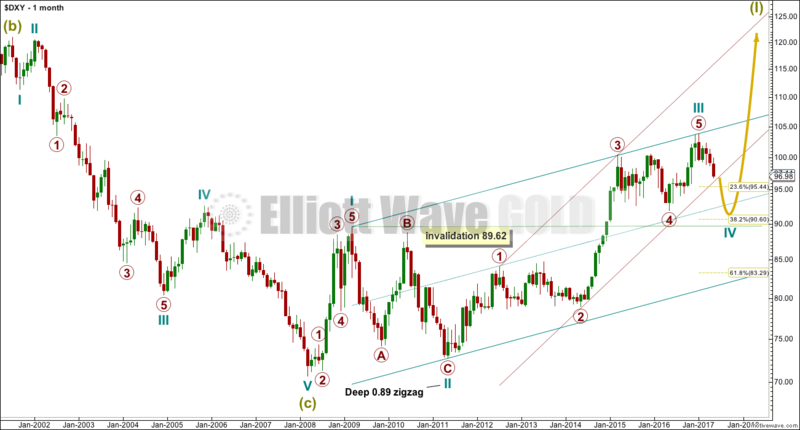 This labelling assumes that primary wave B may be a zigzag. 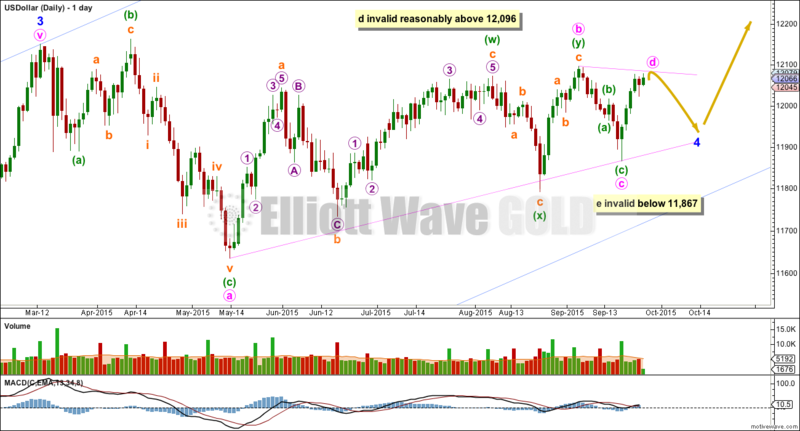 But this labelling may need to change as primary wave B may be any one of more than 23 possible corrective structures. 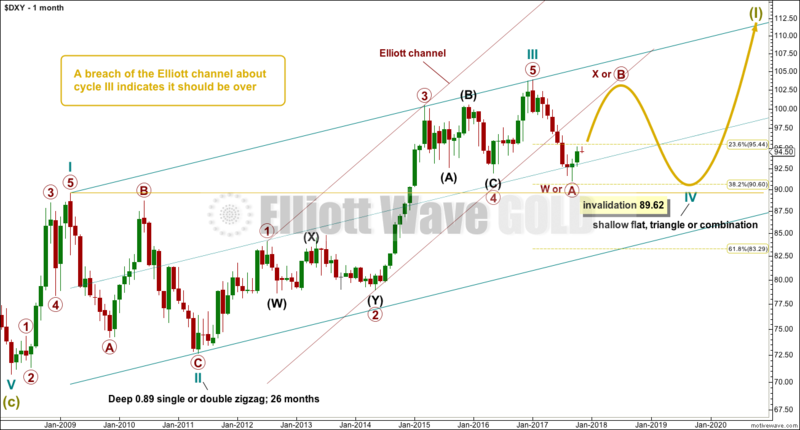 The blue channel is an Elliott channel about the first five up. 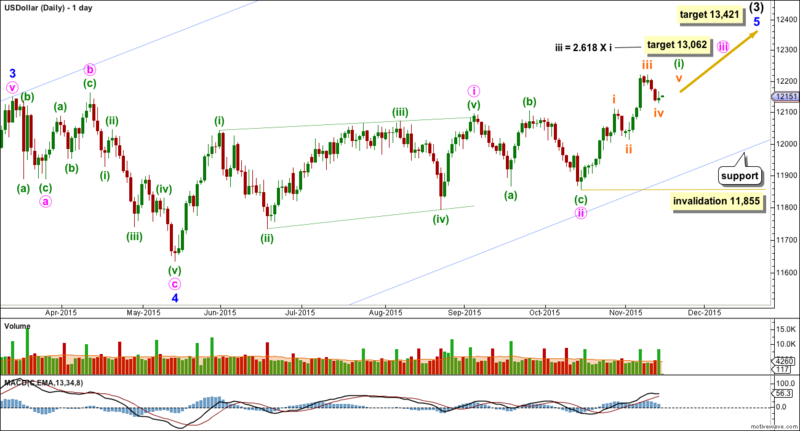 This may be intermediate wave (A). 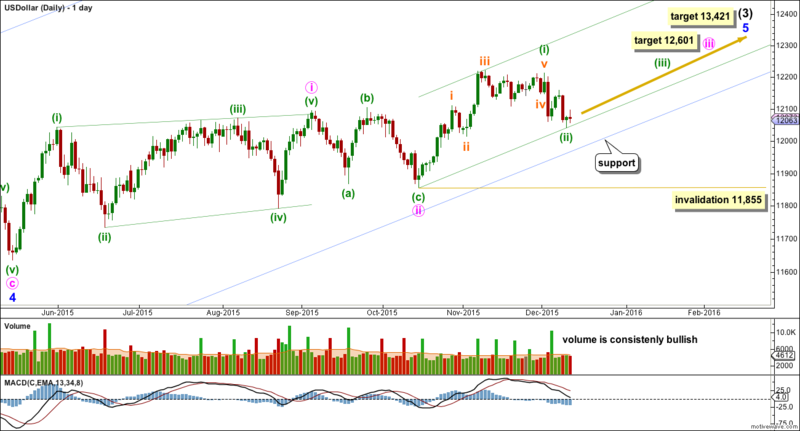 Assume the trend remains up while price remains within this channel. 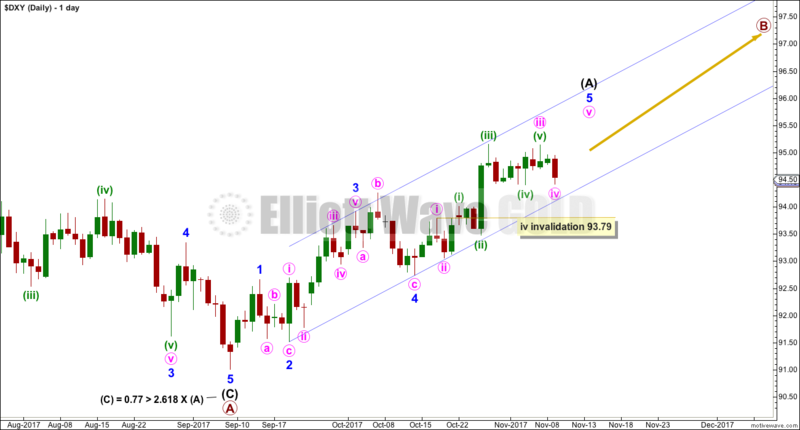 Minute wave iv may not move into minute wave i price territory below 93.79. 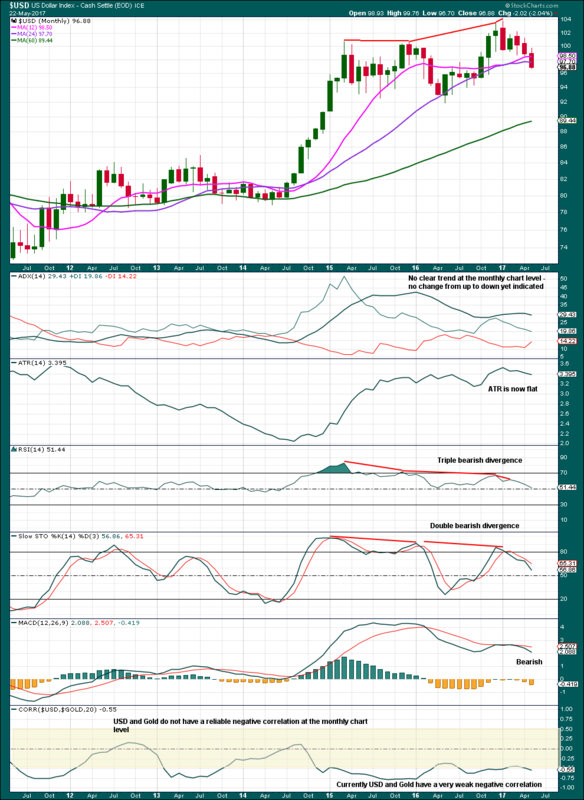 ADX is still declining, so it does not yet indicate a trend. 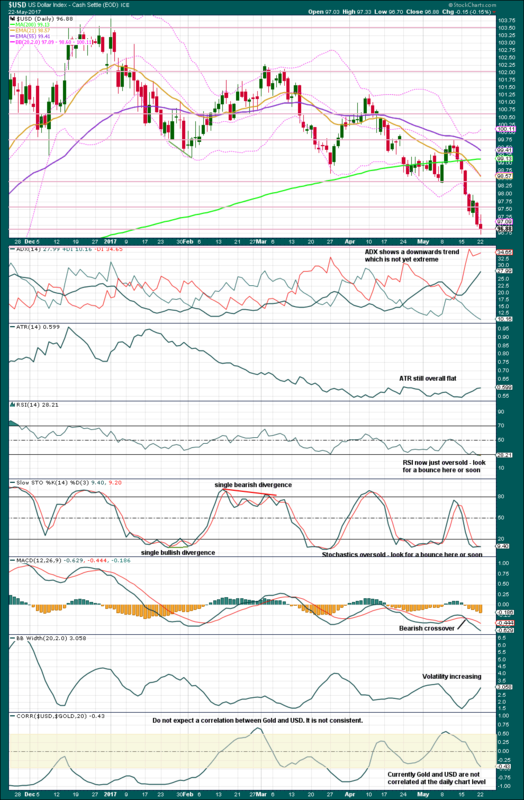 Both the one and two year moving averages are now negatively sloped and price is below both. The one year average may be now crossing below the two year average. This would be a full bore bearish look. 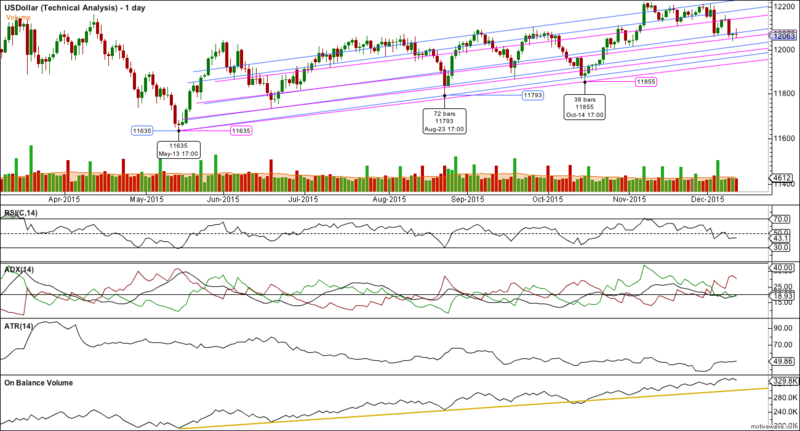 With RSI not oversold and Stochastics exhibiting no divergence with price at lows, there is room for price to fall further. 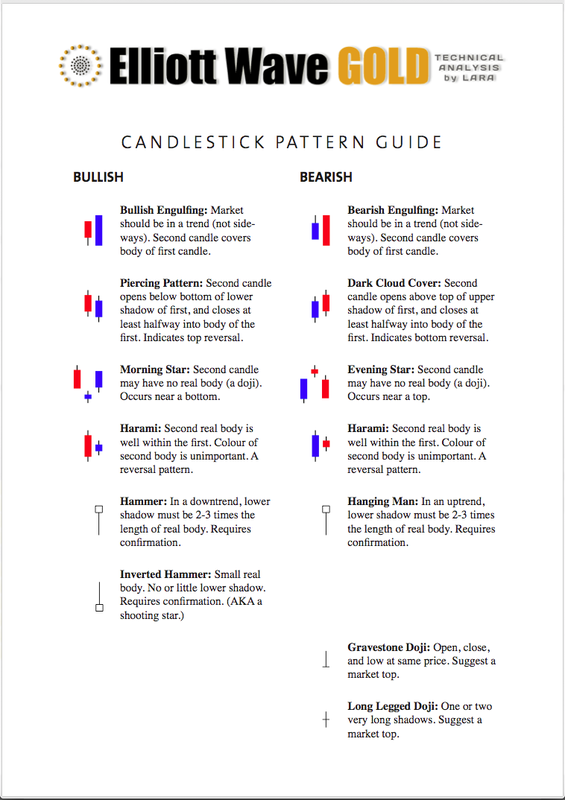 Give the bearish engulfing candlestick pattern weight, because this suggests the Elliott wave count is wrong for the short term and a reasonable pullback or consolidation may develop about here. The upwards trend here is extreme. Look out for a turn. 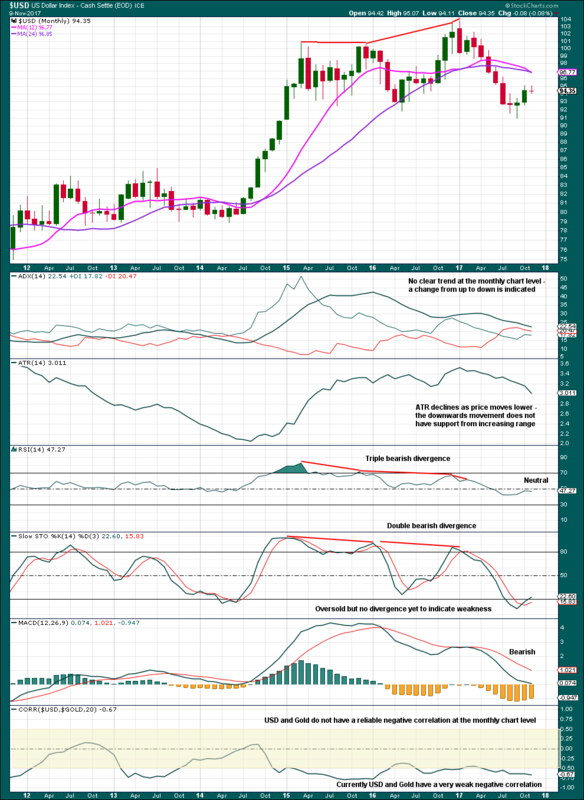 This analysis is published @ 03:00 a.m. EST.